This super-easy, two ingredient glaze is wonderful with roast chicken, pork loin or a firm fish such as swordfish. I first made this recipe for my Roasted Chicken recipe, but use it on many different dishes. This very flavorful glaze will keep refrigerated for up to a week. Do yourself a favor and get a decent balsamic vinegar for your house. I collect balsamic vinegars, and have a wide variety. Some are expensive, some are not. I use the middle of the road ones most often. A balsamic vinegar doesn’t have to be an expensive 15 year old for this recipe, but you don’t want the bargain bin one either. This is very easy and flavorful, and can be whipped up in a jiffy! Try it with roasted chicken, pork loins, or even grilled fish! 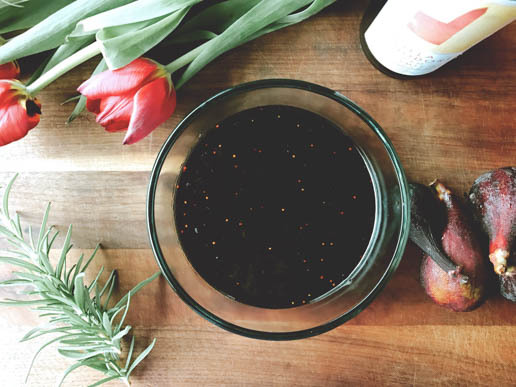 Pour the balsamic in a small sauce pan and bring to a low boil while whisking. Continue to whisk until balsamic has reduced by 1/3 and is syrupy. Add in fig preserves and whisk to fully incorporate. If glaze is too thick add water if necessary.